The following article on PTSD was written by American Military University faculty member, Craig Gilman. Male spouses should note that statistics indicate their female spouses are more likely to develop PTSD than men. All parents should realize that children are susceptible, as well. Visit the NIMH PTSD site for a comprehensive overview of the causes, symptoms, treatments and tips for living with PTSD. If you suspect a loved one might suffer from PTSD, professional diagnosis and counseling should be strongly pursued. 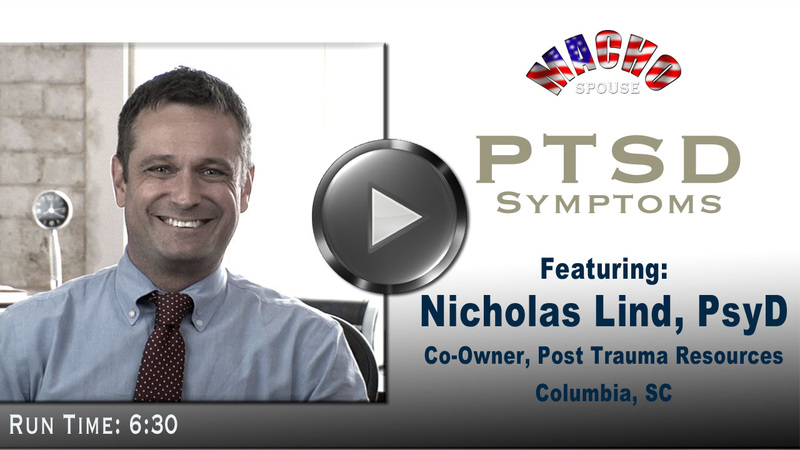 Post Traumatic Stress Disorder (PTSD or PTS) is a serious battle injury we wanted to know more about, so we found Nicholas Lind, PsyD, Co-Owner of Post Trauma Resources (Columbia, SC). In this multi-part series, Dr. Lind defines PTSD, explains the symptoms, shares how and when to seek help, and offers insight into living with someone who struggles with PTS symptoms. This first video offers a thorough explanation of what causes PTSD and how it may affect our families. Post Traumatic Stress Disorder is a serious battle injury we wanted to know more about, so we found Dr. Nicholas Lind, Co-Owner of Post Trauma Resources (Columbia, SC). In this multi-part series, Dr. Lind defines PTSD, explains the symptoms, shares how and when to seek help, and offers insight into living with someone who struggles with PTS symptoms. This video offers advice on how a spouse can start the process of helping a loved-one who may be experiencing post traumatic stress symptoms. PTSD, is there a cure? Post Traumatic Stress Disorder is a serious battle injury we wanted to know more about, so we found Dr. Nicholas Lind, Co-Owner of Post Trauma Resources (Columbia, SC). In this multi-part series, Dr. Lind defines PTSD, explains the symptoms, shares how and when to seek help, and offers insight into living with someone who struggles with PTS symptoms. In the 4th segment, "Treatment," Dr. Lind shares his philosophy behind what makes PTSD treatments effective and what programs Post Trauma Resources uses to help those suffering from PTSD control their symptoms. Dr. Lind also offers a long-term prognosis to those families affected by this injury. The 2nd Macho Spouse PTSD video, Symptoms of Post Traumatic Stress Disorder, is now live! Dr. Nicholas Lind, Co-Owner of Post Trauma Resources (Columbia, SC), discusses typical PTSD symptoms while offering some advice on how best to start an initial conversation with a loved-one who may have PTSD.